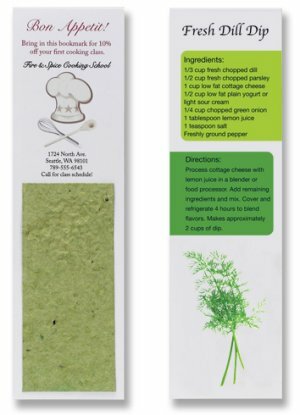 Unique bookmark features your full color message and planting instructions on front with vibrant herb seeded insert and recipe on back. All printed in full color. Grow the herbs, make the recipe and save the bookmark. Choose from Basil, Dill, Oregano, Chives or Thyme. Note: Seeded paper is a natural, handmade product and colors can vary slightly. Note: Price includes bookmark with full color message and planting instructions on front with seeded paper insert and recipe on back. An additional $55 non-refundable artwork charge on new orders must be paid before work can begin. Repeat orders pay $30 artwork reset charge. We also offer Seeded Paper Bookmark products and other personalized Bookmark products.